As a result this film is a slightly more confronting Guillermo Del Toro fairytale horror film than a low budget ghosts n gore effort, only without the sumptuous visuals and eye for detail that GDT is so well known for. Once the glimpses and ‘wait, was that?’ moments give way to more direct menaces the pace instantly accelerates and doesn’t let up. The sudden metamorphosis jolts your attention and at the least proves that the filmmakers are capable of operating on two different levels, but in reality this change in tone pairs a 7/10 first half with a 7/10 second half, despite the fact that the halves seem somewhat incongruous. The Harrow was lauded by critics as being one of the horror films of 2015, when I would claim it to be more a case of ‘being competent in two ways’. Final Rating – 7 / 10. 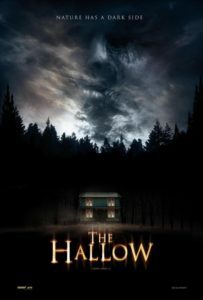 More threatening than Disney’s fairies and less impactful than Del Toro’s, The Hallow is worthwhile without being revolutionary.